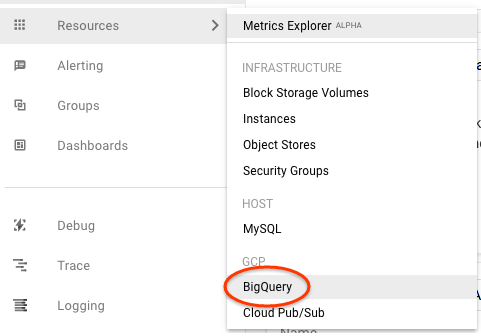 This document describes how to monitor BigQuery resources using Stackdriver Monitoring, including creating charts and alerts for BigQuery metrics. A Google Cloud Platform account. A BigQuery project with billing enabled. One way to ensure that you have both is to complete the Quickstart using the web UI. To use Stackdriver, your project must be in a Workspace. Follow the steps in the Creating a single project Workspace. Select the name of your project if it is not already selected at the top of the page. 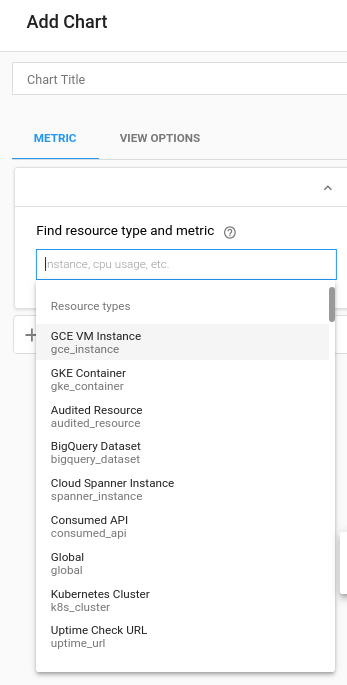 To view BigQuery resources, select Resources > BigQuery. On this page you'll see a list of tables, events and incident reporting that are user configurable as well as charts of project metrics or dataset metrics. Go to the Stackdriver dashboard for BigQuery described in Viewing the Stackdriver dashboard. On the Stackdriver dashboard for BigQuery, scroll to the chart named Slot Utilization. The Slot Utilization chart appears on both the main Stackdriver default dashboard and the Stackdriver dashboard for BigQuery. In the left-hand navigation pane of the Monitoring console, select Dashboards > Create Dashboard. For the Resource type drop-down list, select Global. You might need to expand the list of Resource types, for the Global option to be visible. For the Metric drop-down list, select Query execution time. The Aggregation pane fields control how the execution time data are displayed. You can modify the default settings for these fields. Create an alert by defining a condition and configuring the notification settings. In left-hand navigation pane of the Monitoring console, select Alerting > Create a Policy. This opens the Create New Alerting Policy page. For the Resource type drop-down list, select Global. In the Aligner drop-down list, select 50th percentile. In the Alignment Period drop-down list, select 1. Fill in the Configuration pane fields to trigger if the 50th percentile of any time series exceeds 800 ms in one minute. In the Condition triggers if drop-down list, select Any time series violates. In the Condition drop-down list, select is above. For the threshold, enter 800. The threshold choice is dependent on your needs. The value of 800 was selected as it was about twice the average 50th percentile. In the For drop-down list, select 1. To configure your notification settings,click Add Notification Channel. You can elect to receive notifications by email, SMS, and several other options. Optionally, enter a notification message in the Documentation section. Finally, name your policy and click Save. The following metrics are available, time delayed up to several hours. Scanned bytes and scanned bytes billed can differ for a couple reasons. There is a minimum billing amount. If you scan less than that amount it won’t be billed. If your account has some credit associated with it then these metrics may differ. BigQuery Slots allocated slots Number of slots allocated to the project at any time. This can also be thought of as the number of slots being utilized by that project. Slots are allocated per billing account and multiple projects can share the same reservation of slots. BigQuery Slots allocated by job type slots Number of slots allocated to the project at any time separated by job type. This can also be thought of as the number of slots being utilized by that project. Currently, load and export jobs are free operations, and they run in a public pool of resources. BigQuery Slots available slots Total number of slots available to the project. If the project shares a reservation of slots with other projects the slots being used by the other projects is not depicted. BigQuery dataset Stored bytes Bytes Bytes stored in the dataset - For the 100 largest tables in the dataset, bytes stored is displayed for each individual table (by name). Any additional tables in the dataset (beyond the 100 largest) are reported as single sum, and the table name for the summary is an empty string. Uploaded billed bytes and uploaded bytes billed can differ for a couple reasons. If no queries are running then no data will be returned for slots allocated or for slots available or for any query related variables. Zoom out to see data. If queries are running in both the US and the EU then slots allocated and slots available might be incorrect. Slots allocated is reported as the average value in a time window (the width of the time window depends on the zoom level of the chart). Zooming in and out can change the value of slots allocated. Zooming in to a time window of 1 hr of less shows the true values of slots allocated. At this range for any time visible on the chart, avg(slots allocated) = slots allocated. The data in Stackdriver charts pertains only to the selected project. Multi-project monitoring is not currently available.